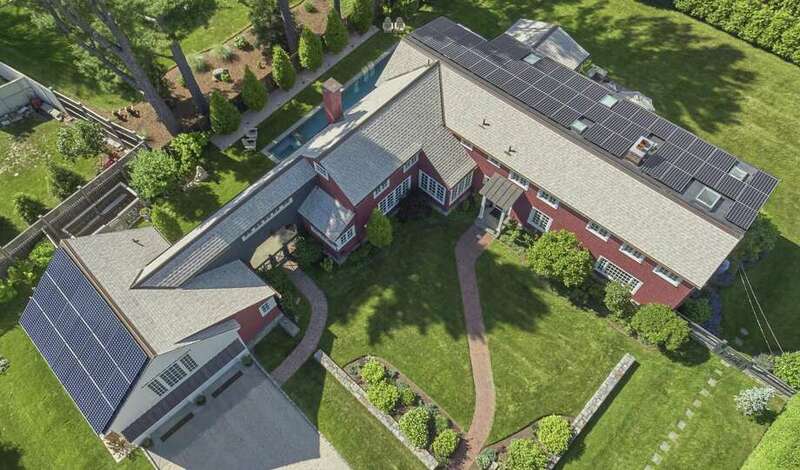 An aerial view of the house at 3 Quentin Road in Westport. NORWALK — Bruce Becker used to spend about $8,300 a year on electricity, heating, water and other costs for his antique farmhouse. Now he spends close to nothing following the additions of LED lights, electric cars, a new cooling roof and more than 60 solar panels on the roof and alongside the home. In Connecticut, more fossil fuel emissions come from cars and trucks than buildings, Becker said. To combat that, he invested about $60,000 in energy-saving devices and materials for his home at 3 Quentin Road. Although $60,000 sounds like a hefty price, he estimated he saves about $10,000 a year from the investment. With the renewables, the home’s energy rating scale moved from 253 to 19, meaning the house uses 8 percent of the energy it used before the renovations. He added two Tesla Powerwalls in his garage, which provide backup power during an outage and eliminates the need for a generator and maintenance. His Tesla app allows him to monitor the level of energy-use from house — and he can preheat and move his car out of the driveway — all with the push of a button. Built in 1917, the house consists of 5 bedrooms and 4.5 bathrooms. Before it moved to its current location in 1960, the house was rotated 90 degrees and sat about 200 feet away, Becker said. He and previous owners tried to keep the 4,000-square-foot compound as close to its original structure as possible with just a few renovations to the kitchen, the front porch, bathrooms and some interior design changes, which Becker’s wife, Kraemer, oversaw. In 2017, he replaced a dark-colored cedar roof, the cause of sweltering temperatures in the house during summer months. By adding a reflective light-colored Solaris asphalt shingle roof, he reduced cooling costs. Leaders of the town’s Green Task Force have their eyes on Becker following his application for a Westport Green Building Award for Achievement in Sustainable Design and Construction. The town’s goal by 2050 is to become a net zero community, one that would greatly reduce energy needs through efficiency. Should Becker win the award, his house would become the first to receive a historic plaque and a Westport Green Award, said Stephen Smith, building official and project manager for the Town of Westport and on the Green Task Force. After Becker’s presentation Thursday, the group is expected to vote and decide whether to extend an award. Becker said he applied for the award to teach others about the possibilities and benefits associated with a sustainable home. As demolition continues to threaten antique homes, Becker and members of the Town’s Green Task Force see a need to continue efforts around preservation. Becker leads presentations at universities and schools including Yale and Greens Farms Academy, educating others about global warming, which he calls a “solvable problem.” All people need to do, he said, is support renewables such as electric cars and energy-efficient heating and homes.